Brent and Miriam reflect on Life, Family and Ministry... in Peru. Change is hard. Change is scary. Change shakes things up, messes up the safe routine of life. Change is also necessary and often good. 2012 was a year of huge change in the life of the Williams family. Guess what? It was hard, scary and shook things up. Guess what else? It was also good. We survived and even grew from it! I am so appreciative of all of you who have followed our journey over the Andes in Peru, our year in the jungle, and some of our little adventures there and in our home. We have heard so many encouraging and kind words about this blog, and it means so much to us. We are no longer "over the Andes" or in Peru. God has brought us home to Texas and this is where we will stay until He moves us again. Texas is very different from Peru, imagine that. Life in the United States, although familiar to our family, is also different from life in Peru. We are adjusting, learning and taking it a day at a time. Oh, we are also enjoying it! We are part of a loving, kind and giving church family that has welcomed us back unconditionally and this has made the transition so much easier. 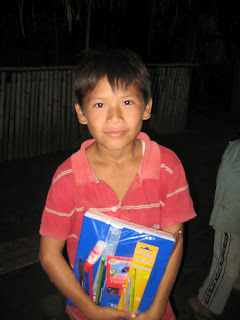 We truly hope your prayers will continue for the Peruvian people you have met through this blog. We hope some of their stories have touched your heart and challenged you in some way. This post is to sign off of this blog site and direct anyone interested to a new one ~ Musings From Miriam ~ at http://miriamruthwilliams.blogspot.com/ ~ I know, not nearly as exciting as being over the Andes, but it is a good way for me to put into words the thoughts, ideas and experiences God gives me. Hope to see you there! Tonight was our last night with our Ashaninka friends. The time has come for us to say goodbye and for them to welcome a young Peruvian couple who will be working with them. We have learned so much from our time with this group of special people ~ generosity, honesty, thankfulness, simplicity and community. Our hearts are full of joy and hope as we leave them in the hands of our Heavenly Father. Our hearts are full of sadness as we will miss all the hugs, kisses, and beautiful smiles. Our fervent prayer is that this small group of believers will reach the other 65 families that make up this community for Christ. We can't wait to go back and see what God has done there. A new school year started this week, so all the kids were abuzz with excitement and how unbelievable the amount of homework they had already!! We were so happy to be able to give each child a packet of school supplies, donated by a lovely friend of ours from Mississippi. They were very thankful. We also took a cake and celebrated the "Day of the Woman" to the delight of all. Some of the little boys didn't understand and I was wished a happy birthday several times! We were so glad that Janet, Driu's mother, stayed for the adult study. This is the second time she has come and we can only pray the seed is being planted in her heart. We praise the Lord that Driu finally seems to be getting better after a serious and long illness that just wore out his little body. He did, indeed, seem to have more life and color. On a sad note, one of the little girls who we have known since the beginning and who always comes on Thursdays, is missing. I hesitate to use her name, as the police have been involved and there is still no sign of her. She is 8 years old and has not been seen or heard from for a month. It appears that she left of her own free will, as she left a note and took some clothes from her house. Some think she left because of her abusive father. Some think she left because she stole a cell phone and the punishment for that is extreme in this community. Some think her older cousin took her to the next town, because she is also missing. It is all very strange and upsetting to everyone. Her mother is worried, her siblings miss her, and nobody knows what to do or how to find her. She should be in school, she should be playing and being a kid, but there is no telling where she is or what she is going through now. I struggle with wanting her back, due to her father's violence but we do worry and are praying much for her. Her eyes are brown. They always have blue eye shadow on them. They smile easily but are also filled with pain. Her mother took her two sisters and left her, her little brother and her father when she was 7 years old. She didn't understand that her mother would never return. She assumed responsibility of her brother's upbringing and grew up quickly. She spent weeks in the fields taking care of her brother while her father worked. When her father remarried, she turned into her brother's defender.....against their stepmother's beatings. She married, had children, divorced, and is now in another relationship. Marriage is really out of the question because she doesn't trust her boyfriend and he doesn't trust her. They both have recently accepted Christ and know they should not be living together. She wants to grow, with or without him. She is hungry for God and to understand Him. She still cries when she talks about her childhood. She still doesn't understand why her mother left her. But she has hope now. She has a future. Her eyes are seeing more clearly. Her eyes are gorgeous. Black. Slightly slanted. Soft. She is gorgeous. She is, by all appearances, an accomplished, independent and smart young lady. The truth is, she is all three of these things. She is also very sweet, loving and a bit shy. She and her boyfriend plan to marry, but she is terrified. She doesn't think she will be able to have an intimate relationship with him.....or any man, ever. When she was 8, her 18 year old half-brother raped her. Her parents did nothing about it. She can't get over it. She hates herself. She thinks she is disgusting. She thinks she is dirt. In Latin countries, it is common for men to whistle at women and/or throw out a compliment as they walk by. Sometimes it really is a compliment, other times it is a gross, unnecessary remark that leaves the woman embarrassed or even afraid. The beauty of this young lady is obvious to all and she frequently hears remarks directed at her. It infuriates her....to the point of throwing fists and/or rocks. She has made men bleed by her rock throwing. (I silently applaud her because someone needs to shut them up). She can't stand to hear even a sincere compliment from a man or to be touched by one. Recently, she received Christ as her Saviour, and is just beginning her new life. She has yet to really see herself as the new creature she is. She knows she needs help and is looking for it. She is learning to look in God's Word for the hope and answers she seeks. I have every hope that she will be a healthy, happy bride someday and will be able to help others who have gone through what she has. I believe her beautiful eyes will shine even more when the truth of God's love and acceptance of her thoroughly permeates her heart. We were so happy to see Edison and Kati at church last week. Their village is only about 5-7 minutes from the church in Pichanaki, so we're really hoping they will get into the habit of coming. Edison has almost fully recovered from his illness, and has worked a temporary job this week, but is once again without work. Baby Driu has gotten a little better, but is still very sick. It's amazing how much his little body has taken. His parents have taken him and his big brother, Linder, high up into the mountains to work in the fields, harvesting coffee. We can only pray that God will touch Driu's tummy and heal him. Lydia was telling us about her orchards that were flooded this past week. There is a river behind her house, about a mile away. There has been so much rain, the river rose and flooded her harvest and almost reached her house! She said this only happens about every 4-5 years. This is how they live and it is devastating when they can't sell all of their crops. It affects their economy for the whole year. Studying about our identity in Christ this week, distractions abounded.......the drunk neighbor who decided to lie down and sleep it off in Lydia's outdoor kitchen, the one, dim, green light bulb we tried to read by, the stray, skinny dogs wandering around, the kids yelling and playing ninja, the crying babies, the mosquitoes, on and on I could go. It is so hard to concentrate and keep anyone's attention for more than five minutes here, but it is the best we have right now and it is good enough. Lydia's hunger is obvious and she hangs on to every word, somehow soaking it in with all that goes on around her. Christ followers... happily married for seventeen years... life coaches for three wonderful kids... missionaries since 1997.